It isn't difficult to choose both if you stop and think before you speak. We live in a world where we are constantly asking and answering questions. We want to know when to meet, what people think of the characters of the new series on Netflix, if we should wear the dress or go as is. These questions require answers, and while a yes or no may suffice in some cases, more thought goes into that yes or no than you may think. Being honest is really hard sometimes. You don't want to hurt the feelings of people who are important to you, but you also don't want to feed them lies because it makes you feel guilty. You want everyone to be happy. Say your friend asks you if you like the dress she tried on. If you are honest, you tell them yes or no, maybe you sugar coat it. What do you do if it's the worst dress to have ever ended up in stores and you can't believe they chose it? You say...what? Do you tell them that the dress will sit in their closet and never see the light of day? Maybe you tell them it isn't your style but they can pull it off? Perhaps even tell them that it doesn't flatter them in any way. Which situation is going to lead to a positive outcome where you don't lie to yourself or them? Honesty is important in any relationship, but there is a classy way to go about it. If you're unsure as to how to go about it, think about what you would want someone to tell you in that situation. Do you want to know if there is something in your teeth? If your hair looks okay? Yeah? Well I'm sure your friend would want to know too and would appreciate you telling them without alerting the whole party. What do you do at work if there is a task that your boss asks you to do and you don't have time? Do you tell them no? Yes? I will get to it when I can? You may not want to do it but it is a part of the job so you have to. It may be something extra but it will help your career so you take it on. Maybe they really were just too busy and needed help. You can ask questions about it. Make sure you aren't overloading yourself as you try to get through your usual workload. With family it can be easy to be honest with some people, but not all with others. If your grandma gives you a hand knit sweater and wants you to wear it the rest of the day, there isn`t really a way to scratch your way out of that one. 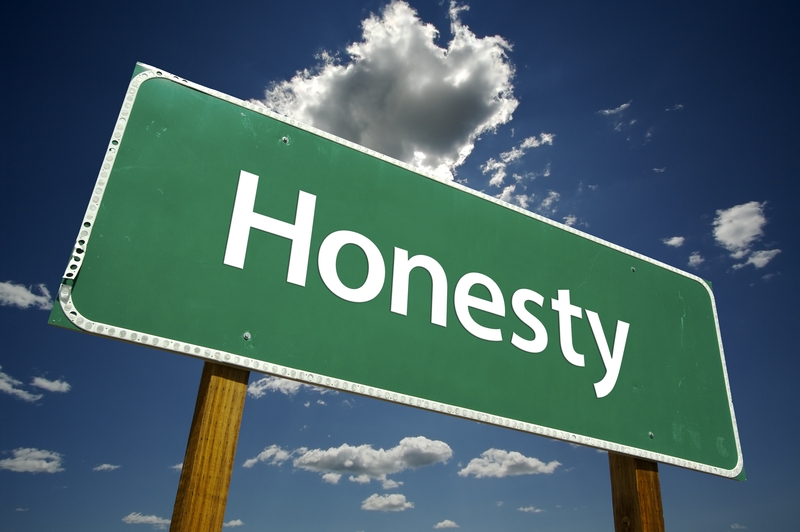 Personally being honest with my immediate family is easier than being honest with grandparents or other relatives. With them, I know they may be disappointed I didn't like it, but they are glad they aren't paying money for something to sit around all day and collect dust. With grandparents, they put time and effort into picking out something for you, or maybe they even made it. In that case you just have to accept that they love you and the itchy material doesn't have to be worn 24/7. With yourself honesty can be hard too. There are times when you know something but choose to ignore the facts. There are others where you tell yourself not to get something because yes, it does look like you're wearing clown shoes when you put those on. Honesty - true, kind honesty - is hard to come by these days. Sometimes it is best to be blunt. Other times you need to think about the other person and not grind their self esteem to dust. Each situation is different and requires a different tone, a different approach, and we all need to be aware of that.